Winter brings along with its chilling temps a host of water damage possibilities. Residential homes are especially vulnerable to water damage during the winter season. Three main types of winter water damage are common when the weather is below freezing. Burst pipes are one of the top sources of water damage that can be prevented. Roof leaks are an enormous burden, which, again, with proper attention, can be stopped before transforming into an expensive repair. Outdoor water sources can also be a likely source of winter water damage when left unattended. Pipes, whether plastic or metal, are notorious for bursting in subfreezing temps. Contrary to popular assumption, pipes rarely burst due to expanding ice contained within them. 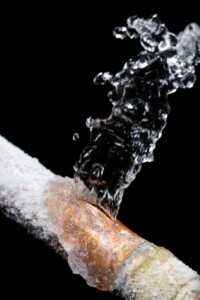 Rather, pipes break due to the buildup of water pressure between a sink’s faucet and an ice blockage. No matter how sturdy a pipe may be, it’s no match for expanding water. The pipe will rupture. Typically, the pipes that are especially prone to breakage are uninsulated ones that are located along the exterior walls and water pipes that run along unheated areas of a home, like the attic, basement, garage, crawl space or underneath a kitchen sink. Insulation is the number one protection against a burst pipe. Prior to winter, inspect all areas of your home that contain unheated water supply lines. Pipe sleeves can easily be purchased and fitted to the pipes in the garage, under the sink and beneath the bathroom cabinets. If pipe sleeves are unavailable, experts recommend using a quarter-inch of newspaper to surround the pipes, which offers an equally effective solution against the damage caused by sustained freezing temperatures. Maintain a cozy indoor temperature to prevent frozen pipes. Especially when you are away, run the heat continuously at no less than 55 degrees Fahrenheit. Experts also suggest maintaining a consistent temperature throughout the home. (This is costlier than turning down the heat at night, but it may prevent an even more expensive broken pipe fix.) Another tried and true method to prevent a split in your water pipe is to let the faucet trickle small amounts of water. Dripping even the tiniest volume of water during subfreezing temperatures allows the water to run through the pipe without freezing. Unheated compartments of a home can also benefit from warm air. A winter weather defense strategy like this can be achieved by leaving open the kitchen cupboards and bathroom cabinets to allow warm air to circulate around the pipes. Lastly, keep garage doors closed if water lines run through them. When water pipes are frozen, they can be thawed. Apply a towel soaked in hot water around the frozen pipes to gently thaw the freeze. An electrical heating pad will do the trick, just as well. Also, keep the faucet running, which allows the flowing water to gradually melt the ice. Gutters are invaluable in directing running water away from your home. When gutters freeze, however, or are blocked by ice, they can end up being rather destructive. A home’s gutter system can get weighed down by ice buildups. When the snow along the roof melts from heat that escapes from inside the home and trickles into the gutter, it pools and freezes into what is known as an ice dam. 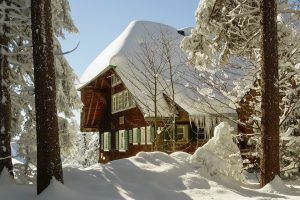 Snow that melts from the home’s internal heat is a key indication that there is a lack of proper insulation. Ice dams along the gutter put unnecessary stresses on a roof. Water can infiltrate underneath the roof shingles, lifting them up and causing roof damage. Roof leaks are the result. Once a leak happens, you may find unsightly water marks along your home’s ceilings or drips that cascade into your home’s interior—both causes for concern. When you detect a faulty shingle, take immediate action to replace it, especially prior to the winter season. It’s more cost effective to replace worn shingles as you find them, rather than replacing an entire roof. Observing your home’s gutters and grading during dry or rainy weather and before winter helps to ensure your roof is properly prepped for winter. When the first snowflakes fall, it’s far easier to enjoy its splendor than it is to remember what’s left on the ground underneath the snow. Outside water sources can be irksome when subject to subfreezing weather. Be sure to remove all outdoor hoses from the yard. Drain them and store the dry hoses inside. Plus, shut off valves that supply water to the outdoors. All hose bibs should be opened to allow any remaining water to drain. Experts suggest leaving the outside valve open so that any excess water has enough room to expand without breaking the pipes. When a water pipe in your home’s plumbing system unexpectedly bursts, surges of water end up penetrating the surrounding areas at breakneck speeds. As a homeowner, you’re left with puddles of water and the likelihood of mold infestations to clean up. Or, perhaps a roof has finally given in during the dead of winter, resulting in drips of water that causes property ruin within minutes. Despite all preventive measures, disasters tend to occur. 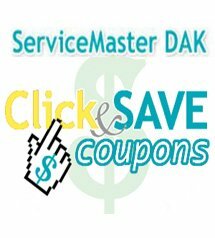 When an emergency happens, contact a professional water damage restoration company, like ServiceMaster DAK. Specialists from companies like these are well-equipped to drain all excess moisture from homes and businesses in substantially less time than a standard dehumidifier. It is crucial to remove standing water immediately, due to the growth of mold and bacteria that occurs within hours. Water damage restoration technicians use advanced meters to detect the level of water damage. Air movers and other high-tech equipment are used to thoroughly dry out the affected areas. Our specialists will quickly return your home to its pre-damaged condition. 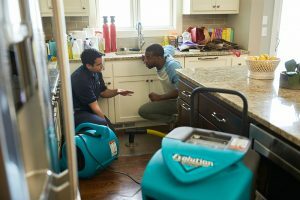 The certified water damage restoration technicians at ServiceMaster DAK respond immediately to calls within the north and northwest Chicago suburbs, 24 hours a day, 365 days a year.